You'll find details of our fees and charges in our pricelist. It’s easy to find, request and renew a book online with our library catalogue. You’ll need your membership number and PIN to set up an account or login. Call into any library with your membership card to get a copy of your PIN if you don’t have it. 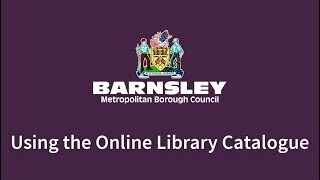 We've produced a video guide to using our online library catalogue for you to watch. If you don’t use our online catalogue, you can use our enquiry form to ask us to request or renew a book for you. If we don't have the book you want we may be able to get it from another library for you, such as the British Lending Library. There's a charge to request a book and this varies depending where the book comes from. Most of our books can be borrowed for a period of three weeks. Adults can borrow up to 20 books at a time and children can borrow 10. We can photocopy sheet music if you want more than one copy for a group or society. To borrow a DVD or CD you must be over the age of 14. You must also comply with the age classification on the DVD, for example 15 rated or 18 rated. Premium DVDs have a two day loan. All other DVDs have a one week loan. The selection available includes feature films, music, comedy, TV shows, sport and documentaries. You can borrow a maximum of three DVDs at a time. You can borrow up to 10 CDs and talking books at a time for three weeks. There is a charge to borrow a CD or DVD. See our library prices . There is also a charge to renew CDs or DVDs. From time to time we have special offers on rentals such as three for two on DVDs and CDs. You can borrow open learning items for any coursework or study that you’re doing for three weeks initially. Following this you can renew them for a further 12 weeks. If you don’t return items when they are due there will be a charge. You can login to your library account with your membership number and PIN to find out if you have an outstanding balance. You can pay at the library when you return overdue items. If you lose an item while on loan you will be charged the current cost of it. For damaged items the charge is the cost to repair or replace it. There are some exceptions for damaged items that are part of children’s collections.